Contemporary design set among endless lakes and countryside at De Vere Cotswold Water Park. Discover the unique Cotswold Water Park in our extensive grounds and the exceptional landscapes of the Cotswolds beyond. A warm welcome awaits in our refurbished Lounge. Comfy chairs and modern decor offer a place to relax in our new lounge. A quiet spot to unwind. Enjoy all day dining and drinking with views of the Water Park from The Old Boathouse. Savour British classics and seasonal specialties at The Old Boathouse. Dine in our recently refurbished restaurant or outside on our lakeside terrace. Outdoor spaces for you to dine, relax, and unwind. Enjoy seasonal dining in a contemporary lakeside setting at The Brasserie. Forgotten something for your trip? The Pantry offers lots of every day essentials at the same price as your local corner shop. Impress your guests in the spacious Mallard Suite with wonderful lakeside views. The Mallard suite private terrace is a perfect break out space for your guests. Make business a pleasure in our light filled meeting spaces. Catch up with colleagues on our private terrace spaces. Make every event memorable with revitalising views across the lake. A wonderfully rural setting for an exclusive celebration. Our modern wedding suites have plenty of natural light and views across the lake. The stage is set for a wedding day like no other. Many of our wedding suites have their own private balcony - each offering exclusive views of the lake. A wonderful backdrop for a very special celebration. Take time out at this luxury spa retreat. Find relaxation and luxury at the tranquil Spa6. Meet your fitness goals in our state-of-the-art gym. 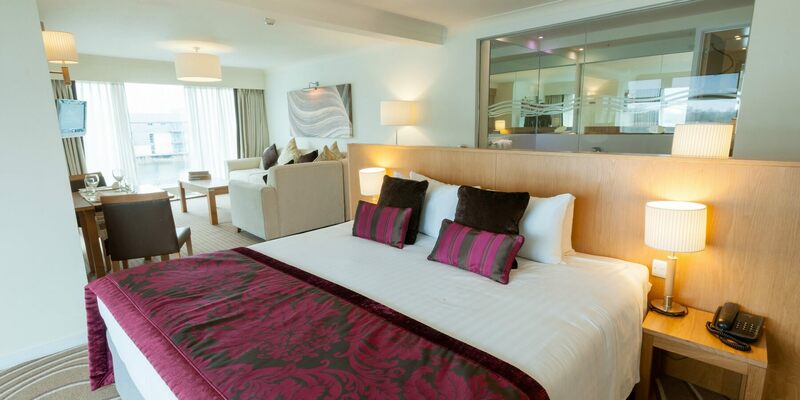 Relax in style in our lakeside bedrooms, complete with balcony. Natural tones meet modern style in our bedrooms. Our twin bedrooms are thoughtfully designed to ensure a relaxing stay. Unwind in the comfort of our contemporary Suites. Discover light filled spaces in our lakeside apartments. Natural materials and modern design combine in our lakeside apartments. Awaken your senses, stretch your legs and enjoy some well-earned family time this spring - in your very own light and airy self-catering apartment. A strikingly modern, lakeside hotel, De Vere Cotswold Water Park offers a plethora of things to see and do for grown-ups and little ones. Experience family-friendly dining at the Old Boathouse, drinks in the Lounge, or pause to take tea (and ice cream) in the Muddy Duck café. While you're here, embark on a wild nature trail, or travel a little further afield to explore the fascinating local area. If you get chance, you could even escape to our relaxing spa for some tranquil 'me time'. Places are limited, so book now for stays from 16th February to 22nd April (Easter Monday) 2019. *Terms and conditions apply to all offers. Offer is subject to promotional room & rate availability and date restrictions may apply. Offer cannot be used in conjunction with any other offer, discount, group, or negotiated rates. No cash alternatives are available. All extras are subject to availability and not guaranteed. Standard cancellation terms and conditions apply.